Françoise Hardy in the ’60s influenced the chain mail pieces of the Paco Rabanne by Lydia Maurer Autumn/Winter 2013-2014 Collection. Other Françoise Hardy-inspired collections : AG Denim (the « Classic » capsule collection, launched in January 2013, was influenced by Françoise Hardy and the Beat Generation in ’60s Paris), Alice McCall Autumn/Winter 2007-2008 (according to Alice McCall, this collection exuded a « ’60s rock chick vibe, a bit Françoise Hardy »), Balenciaga by Nicolas Ghesquière Autumn/Winter 2005-2006 (Nicolas Ghesquière said that this collection was « a little bit Françoise Hardy »), Carrie Hill (in June 2010, Carrie Hill told « British Vogue » that her perfect muse would be someone like Françoise Hardy), Comme des Garçons (the name of the brand, established by Rei Kawakubo in 1969, and which means « like the boys », was taken from Françoise Hardy’s lyrics), Eric Bergère Autumn/Winter 2000-2001 (Eric Bergère dedicated this Parisian collection to Françoise Hardy), Jill Stuart Autumn/Winter 2007-2008 (this collection was based on ’60s icons such as Françoise Hardy), Maje (on September 10, 2012, Maje launched an « Icons Forever » collection dedicated to Françoise Hardy, ’60s era, featuring 4 T-shirts, accompanied with 4 bags), Mirror / Dash Autumn/Winter 2008-2009 (for this collection, Kim Gordon, Melinda Wansbrough and Jeffrey Monteiro designed the « Hardy » jacket, named after Françoise Hardy ; moreover, in the ’90s, Kim Gordon tried to duplicate the white pants that Françoise Hardy wore on a photograph with Bob Dylan, for her X-Girl label), Rebecca Minkoff Pre-Fall 2012 (this collection channeled Françoise Hardy in the ’60s), Salvatore Ferragamo by Massimiliano Giornetti Autumn/Winter 2013-2014 (« Françoise Hardy meets Monica Vitti » was the theme of the hairstyle of this show, by Luigi Murenu), Umit Benan Spring/Summer 2013 Menswear (this collection was partly inspired by Françoise Hardy’s androgynous style), Yigal Azrouël Autumn/Winter 2012-2013 (for this collection, Yigal Azrouël drew inspiration from Françoise Hardy’s idea of privacy). Iris « Easy » Steensma, the child prostitute who was portrayed by Jodie Foster in Martin Scorsese’s « Taxi Driver », influenced the Marc Jacobs Spring/Summer 2011 Show. Other Taxi Driver-inspired collections : Bottega Veneta by Tomas Maier Autumn/Winter 2013-2014 (the Guido Palau-styled hair of this show referenced Jodie Foster in « Taxi Driver »), Karen Walker Spring/Summer 2012 (the theme of this show played with the concept that « Taxi Driver »’s Iris and Betsy were 2 different sorts of American women), Peter Jensen Spring/Summer 2009 (this show paid homage to Jodie Foster’s different looks, including in « Taxi Driver »). Milk inspired a vegan-friendly slogan in the Jeremy Scott Autumn/Winter 2011-2012 Show. Other milk-inspired items : Olympia Le-Tan Autumn/Winter 2013-2014 (milk carton-shaped canvas bags, embroidered with « Consumer Farmer Milk : The best milk ever » message ; these items were presented for the 1st time in 2011). The unicorns, designed in collaboration with Ferry Gouw, which feature in the Lulu & Co. Autumn/Winter 2013-2014 Collection, titled « Another Girl, Another Planet », are inspired by Jason Steele’s « Charlie the Unicorn » Flash animated short films. The Bellavance Autumn/Winter 2013-2014 Collection is based on Dario Argento’s « The Stendhal Syndrome », and the Stendhal syndrome itself (a psychosomatic disorder when someone is exposed to immensely beautiful art, which can cause hallucinations). 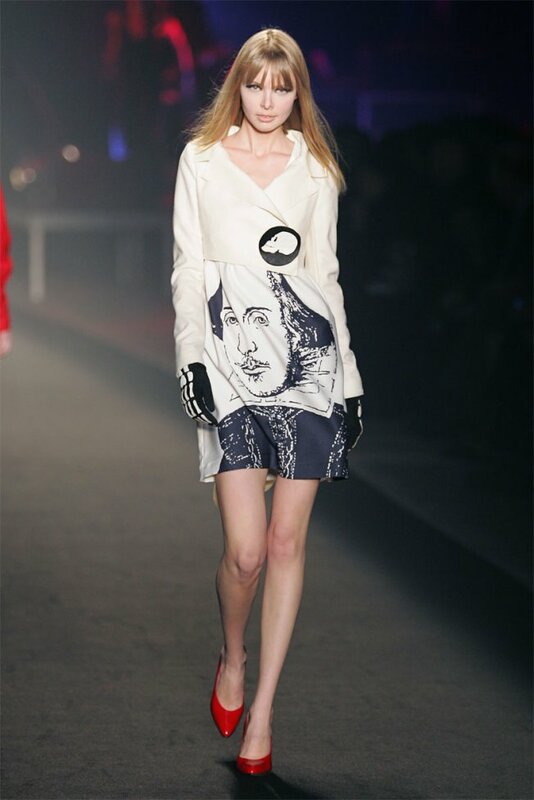 William Shakespeare was one of the British icons that Jean-Charles de Castelbajac celebrated in his Autumn/Winter 2006-2007 Show. Other William Shakespeare-inspired collections or items : Juliette Has a Gun (the heroine of this French perfume brand, founded by Romano Ricci, is a revisited version of William Shakespeare’s Juliet), Romeo Gigli (the bottle of the perfume that Romeo Gigli launched in America, in 2003, was engraved with an extract from William Shakespeare’s « Romeo and Juliet »), Strange Invisible Perfumes (this perfume brand, created by Alexandra Balahoutis, was named after a line in William Shakespeare’s « Antony and Cleopatra »), Temperley Spring/Summer 2006 (the makeup of this show, by Charlotte Tilbury, was inspired by « Hamlet »’s Ophelia), Vivienne Westwood (Vivienne Westwood designed a T-shirt with a « William Shakespeare with a red nose » print, exclusive to T.k.maxx, to celebrate Red Nose Day 2011, with a percentage of profits going to Comic Relief, that helps to change lives in the UK and across Africa), Yves Saint Laurent Couture Autumn/Winter 1980-1981 (this collection was an homage to William Shakespeare’s work), Zadig & Voltaire Autumn/Winter 2008-2009 (« William Shakespeare » slogan on a sweater). The Flintstones partially inspired the Christopher Kane Spring/Summer 2009 Show. Other Flintstones-influenced collections : Jeremy Scott Spring/Summer 2010 (although it wasn’t specifically based on the Flintstones, but on Toto Coelo’s « I Eat Cannibals » song, this show evoked them), Lucien Pellat-Finet (in August 2006, Lucien Pellat-Finet signed a license deal to launch a line of Flintstones-themed cashmere sweaters for Autumn/Winter 2006-2007).